UNITED NATIONS (Sputnik), Anastasia Levchenko - There is no fixed date for reopening of the main checkpoint on the Jordanian-Syrian border, as it will happen once technical discussions are completed, Jordanian Foreign Minister told Sputnik. "We have said repeatedly that we want open borders with Syria. For that to happen, technical committees have to meet and agree on arrangements that would ensure the border's opening in a way that is feasible for both countries … The date that was given [by the Syrian Transport Ministry] is not something that we are aware of as Jordan," Jordanian Foreign Minister Ayman Safadi told Sputnik in an interview. The relevant technical committees have held a number of meetings but have not finalized their work yet, so they are still to reach an agreement on all those arrangements before the borders are opened, the minister clarified. Safadi also stressed that "Jordan did not close the borders with Syria, the borders with Syria were closed because the Syrian government lost control of their side of the border, and therefore the closure of the border was an outcome of the new reality." The minister also commented on the US-proposed Middle East Strategic Alliance stressing that it was still "a concept at an early stage of discussions, but once created it would hopefully aim to address the issues related to regional crises." "It's a very early stage of this concept yet. A lot of discussions are going to have to be made in order to see what a final format comes in. In principle Jordan always believes in all of us working together to address the challenges and solve the crises," Safadi said. The official stated that the United States offered its ideas to set up "the collective mechanism to address regional challenges" at Friday’s meeting stating that Jordan would "engage in a positive conversation with a view to ensuring that whatever we come up with will be a structure that would allow us to collectively address challenges and help us achieve peace, stability and security." He further noted that the region has been seeing many crises that "have regional and global implications, and therefore any collective effort on that would be useful in solving them." Speaking about stabilization in Syria, Ayman Safadi pointed out that Jordan supported it, and the state would create the necessary conditions for the voluntary return of refugees to their homes. "As for refugees, we encourage their voluntary return. In order for refugees to return, they will need to know they will go back to their houses and towns. Conditions on the ground must be conducive for their return. Hence is the need for stabilization. A refugee in Jordan will not go back to Syria unless he feels that there is food for his children, that he is safe and secure and can live in dignity," Safadi said. He pointed out that Jordan wanted to continue providing humanitarian aid to Syrians. The official further noted that Jordan and Russia were engaged in serious discussions related to the dismantling of the Rukban refugee camp in Syria. "There is the Rukban displaced persons' camp in Syria, and we are engaged in serious talks with Russia on the de-establishment of that camp and the returns of its inhabitants to their homes. When refugees in Jordan see people from Rukban going back to their homes and villages and they are safe there, they would say: it's a good sign, let's go back too," Safadi said in an interview. He added that Jordan and Russia agreed on the necessity for the voluntary return of Syrian refugees. "On refugees, the Russians and Jordanians have discussions, and we agree that we need to encourage voluntary return. We agree that we need to work on creating conditions that would encourage refugees to return. It has to be a process. People go back when they feel safe. A good first step would be for IDPs to go back," Safadi noted. "If you are a refugee in Jordan and looking across the border, you will consider going home if you see that internally displaced persons are going back. Refugees will not go back based on a news report. They will go back when they get a call from a cousin or a neighbor saying: it is safe, come back and bring your family," he explained. Safadi stressed that Russia and Jordan together had done tremendous work, and continued to engage in a positive, open, and honest dialogue. "We have done a lot of things together in trying to help solve issues related to the Syrian crisis and minimize danger. The trust and openness on which Jordan and Russian relations are based allowed us to work extremely well together few months ago in the south, and I think our collective work has enabled us to prevent a massacre and displacement of tens of thousands of Syrians. We worked together on reconciliation deals that prevented a catastrophic confrontation in the south before the government took control of the area," Safadi said. 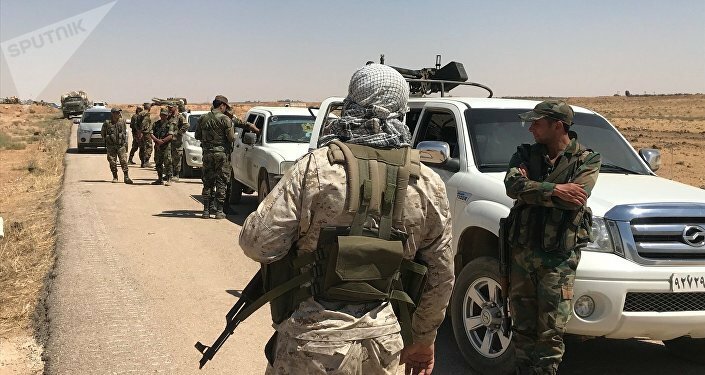 On Saturday, the Syrian Transport Ministry said that the logistical arrangement was required to reopen the Nasib checkpoint on the Syrian-Jordanian border, and it would be completed by October 10 — the step would allow the transport traffic across the frontier to resume. The Syrian government forces regained control of the checkpoint, captured by terrorists in early 2015, in July. The border crossing plays a crucial role in the transit of goods among Jordan, Lebanon, Syria, Turkey, and the countries of the Persian Gulf.